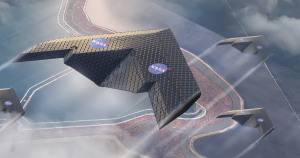 A team from NASA and MIT has created a new type of airplane wing — and it could make air travel far more efficient. In a paper published in the journal Smart Materials and Structures on Monday, the researchers describe how they built an airplane wing from hundreds of identical, lightweight cube-like structures, all bolted together and then covered with a thin polymer material. The design allows the wing to change shape automatically, adjusting itself to whatever configuration is optimal for the current phase of flight — with one configuration for take-off, for example, and another for landing. The wing the researchers created and tested for the new paper is about the same size as what you’d find on a single-seater plane, according to MIT News, but they’d already demonstrated their design’s feasibility with a smaller wing several years ago.